Latest Pokemon Wifi Event: Fancy Pattern Vivillon! 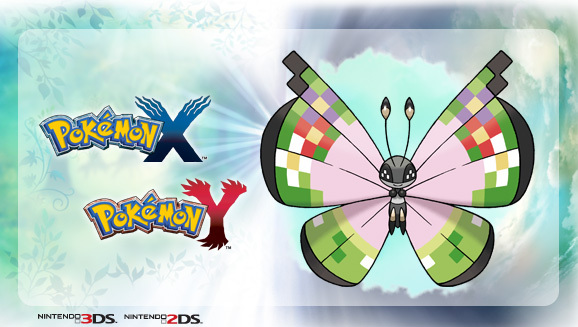 We have a really special Pokémon wifi event to introduce: A Vivillon with a special pattern! As seen in a recent announcement by Pokemon.com, Pokémon X and Y players will be able to download Vivillon via wifi (for free) in honor of the 100,000,000th Pokémon traded via the Global Trade Station! Vivillon was chosen for the event based on its diversity, since Vivillon’s wings change depending on which region you are in. With the GTS reaching its 100,000,000th trade, it seems appropriate for this Pokémon to represent the world’s diversity. Vivillon joins the party at Level 12 knowing Gust, Light Screen, Struggle Bug, and Hold Hands with the ability Shield Dust. Be sure to get yours before it is too late! Watch as you receive Fancy Pattern Vivillon!